It took a considerable amount of work for the Teignmouth, Devon, United Kingdom trio – nearly two decades (16 years) and five albums – but its should be safe to say by now that Muse is among the shortlist of the worlds elite. 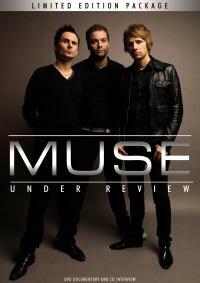 “Muse: Under Review” showcases some of that fact, and does so through the use of interviews with those close to the band, those who have worked with them and helped them out in one way, shape or form. The DVD features interviews with producer John Leckie, who was behind the mixing board for the bands 2001 “Origin of Symmetry,” and also for Radiohead’s “the Bends,” a coincidence that could have lead to the comparisons between the two bands, and former manager Safta Jaffrey. The two voices lend their behind-the-scenes insight and offer a credible break from fans and critics. You also hear from other band insiders such as engineer Ric Peet, director Mat Kirby and biographer Mark Beaumont, among others. “Muse: Under Review” takes the time to offer bios and such for the contributors and those involved, so if you’re not sure who is who and who did what, this DVD has you covered. “Muse: Under Review” takes viewers through the progression of the legend of Muse, and employs the use of photos and live footage to start at the beginnings of the band, following them up until present day. One of the disc’s highlights is a ten-minute mini-doc entitled ‘Capturing the Muse’ which takes a very close look at how the band pulls together their stage shows and subsequent marketing efforts. Keep in mind, this isn’t a concert DVD. It is a two hour plus look at the history of one of the world’s most captivating bands – what they’ve done to get to where they are, as seen through the eyes of a handful of close confidantes who had a hand in getting them there.